THIS house was erected in 1820 or thereabouts, and Nottingham people constantly pass it by without realising its interest or importance. It is said by competent judges to be one of the finest pieces of modern brickwork in Europe. No expense was spared in its construction. Each of the facing bricks forming the facade towards High Pavement was, after being burned, carefully rubbed with sandpaper, tried to a straight-edge and thicknessed. The mortar was very carefully mixed and passed through a sieve to keep out impurities, and the whole structure is a piece of consummate craftsmanship. It is a happy chance that this beautiful house is now in sympathetic hands, and the memory of Booth Edison, the eminent surgeon who was its most noteworthy occupant, is in safe keeping. The site at the corner of St. Mary’s Gate and High Pavement is not without interest, for it was here that there lived, during the fourteenth century, the wealthy wool merchant, Ralph Bugge, who, buying lands and migrating to Willoughby-on-the-Wolds and changing his name to Willoughby, became the founder of the great Willoughby family which, in Queen Anne’s reign, were enobled and became the Lords Middleton of Wollaton Hall and elsewhere. 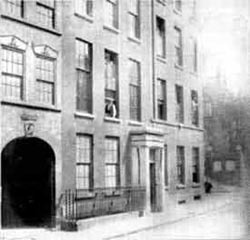 In later days Ralph Bugge’s house in St. Mary’s Gate became an inn under the sign of "The Angel." It has all disappeared, and all that is left to remind us of its presence is the name of Angel Yard.